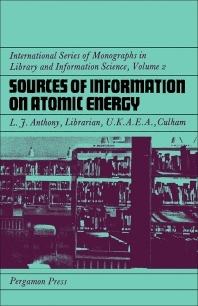 Sources of Information on Atomic Energy is a guide to available literature on atomic energy and to the organizations which originate atomic energy information. The book opens with a chapter that describes, in fairly simple terms, the various aspects of atomic energy and to show how they are related to each other and to other technologies. This is followed by separate chapters that describe the development, organization, and activities of the major national atomic energy projects and other national organizations concerned with atomic energy. These include United Kingdom and those Commonwealth countries which have well-developed atomic energy programs; the main sources of information in the United States; and atomic energy organization in the Soviet Union and some of the smaller countries in the Soviet Bloc. Also discussed are international atomic energy organizations and published literature of atomic energy. Although it is hoped that everyone seeking information in the nuclear energy field will find this guide useful, it has been written primarily with the needs of librarians and information officers in mind since they are often the first people to be approached when information is needed. Atomic Energy Research in the U.S.A.
Other Sources of Information in the U.S.A.
Nuclear Research in the U.S.S.R.